Definition: The Debt Funds are a kind of mutual funds that invest majorly in the fixed income instruments. The objective of the debt funds is to seek current income and preserve the capital. The debt funds are comparatively less volatile than the equity funds and provide a steady income to the investors. Liquid Funds: These funds invest in the highly liquid money market instruments that offer an opportunity for the investor to withdraw money anytime he wants. Generally, the investors invest in the liquid funds to pool their surplus money for a short period, as short as a day. The returns on these kinds of funds are relatively stable and less volatile than the other types of debt instruments. 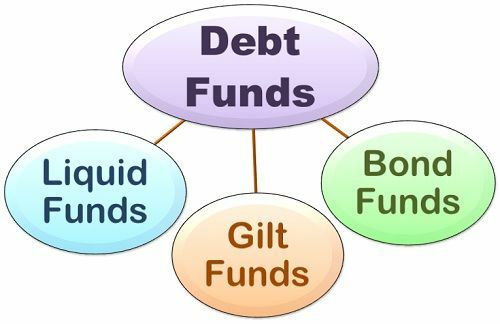 Gilt Funds: The Gilt funds invests in different types of government securities, both long term and short term, issued by the central and state governments. Since the government offers the securities, these come with the zero default risk. This does not mean that these securities are completely risk-free; they do carry the interest rate risk. This means the net asset value of these fund changes with the change in the economic factors and the change in the interest rates. In fact, the long-term gilt funds carry relatively the highest interest rate risk than the other types of debt funds. Bond Funds/Income Funds: These funds invests predominantly in the fixed income securities such as government bonds, corporate debentures, convertible debentures and money market instruments. These fund schemes often work well for those investors who have high risk taking appetite, since these are exposed to the interest rate risk. The investors who are risk averse and at the same time are looking for a tax-free income invests in the government bonds. The fund manager advice the investments in these funds at the time the interest rate has touched its peak and now it will fall. Thus, the debt funds are suitable for those investors who are risk-averse and do not want to invest in the volatile equity markets.